The following are narrative summaries of significant sightings in 2012. For a searchable spreadsheet of all sightings in 2012, please see the Archives on the main Observations page. BRUCE MAST compiles Observations and may be contacted at observe@goldengateaudubon.org. December invariably brings the excitement of CBCs and the possibility of rare ducks, gulls, and raptors, pushed south by severe weather to our north. This year, our winter birding pleasure was saddened by the loss of Rich Stallcup, who passed away on Dec. 15, the evening of the Pt. Reyes CBC. His tremendous influence on the birding community has been amply noted and honored in other forums; suffice it to say that this space will also be diminished by the loss of his incredible expertise and bird-finding skills. A Red-necked Grebe returned to Crystal Springs Res., SM, on Dec. 2 (GC). Short-tailed Shearwaters were ID’d from a Dec. 2 Ocean Beach seawatch, SF (HC), and the following day from Pigeon Pt., SM (RT). Coastal movements of Black-vented Shearwaters didn’t match November totals, but south winds associated with recent rain storms still brought 172 Black-venteds past Pigeon Pt. on the 3rd (RT). The itinerant Brown Booby relocated to N. Dome Rock in SF waters, where it entertained admirers from Sutro Baths Dec. 6–10 (BF; mob). The bird has been sighted periodically along the coast since Oct. 12. Tufted Ducks continued at L. Merritt and Oyster Bay RS, ALA (mob), and a 3rd duck was located among the scaups on Tomales Bay at Inverness, MRN, on Dec. 6 (JE). Beginning the 16th, Harlequin Ducks were reported from Tomales Pt., MRN (JC, IS); Pescadero Beach, SM (MK); and the Marin Rod & Gun Club in San Rafael, MRN (HK; oob). The continuing male Black Scoter at Richmond Marina, CC, was last reported on the 9th (mob). Five Long-tailed Ducks visited the region this month, reported from Mile Rock, SF (JC; mob); the USS Hornet Museum in ALA (PC); Tomales Pt., MRN (JC, IS); Bolinas Lagoon, MRN (BB); and the Cliff House, SF (PS). A hybrid Bufflehead x Common Goldeneye posed for photos on Shoreline L., SCL, Dec. 20 (TGr). Raptor watchers enjoyed sightings of at least 12 Ferruginous Hawks, 4 Rough-legged Hawks, and half dozen Prairie Falcons, along with multiple Peregrines, Bald and Golden Eagles, etc. The Dec. 16 Santa Rosa CBC produced a Mountain Quail at Shiloh Ranch RP, SON (DS). The king tide on Dec. 13 flushed 3 Black Rails along the Petaluma River at Ellis Cr., SON (GHu, AL, GC). A pair of Sandhill Cranes winged over Hayward RS, ALA, on the 30th (BR). Winter storms Dec. 2–9 blew a few Red Phalaropes to the coast, with reports from Pescadero Beach (GHa) and Pillar Pt. Harbor in SM (BK); Salt Pond A15 in Alviso, SCL (PDu; mob); Sutro Baths, SF (BT); and Doran Park at Bodega Bay, SON (DF; mob). Careful observation of the gulls at L. Merritt in Oakland, ALA, on the 8th produced an apparent adult Kumlein’s Iceland Gull (Larus glaucoides) (NA). A Lesser Black-backed Gull (Larus fuscus) joined the gull flock on the roof of Ann Sobrato High School in Morgan Hill, SCL, Dec. 22–23 (SRo; KS). Glaucous Gull sightings remained rare, with just 2 birds reported Dec. 6 from Frenchman’s Cr. in Half Moon Bay, SM (RT; MDF, CHy), and Dec. 27 from the Great Highway at Fort Funston, SF (PS). A Black-legged Kittiwake was observed from the Bodega Bay jetty, SON, on the 30th (RR). At least 40 Ancient Murrelets were reported off the SM, SF, MRN, and SON coasts on 6 occasions, with 14 birds tallied from Pigeon Pt. on the 3rd (RT) and 12 more from Tomales Pt., MRN, on the 16th (JC, IS). The Dec. 29 Calero–Morgan Hill CBC (SCL) located Greater Roadrunners at Hellyer CP (DK, RF) and IBM Almaden Research Center (HMD, DMD). A Spotted Owl was photographed Dec. 7 in Sausalito, MRN (fide KJR). The Dec. 29 Southern MRN CBC tallied a Long-eared Owl at an undisclosed location (fide MF). Short-eared Owls were found patrolling weedy, marshy fields in a dozen locations around the region. A male Costa’s Hummingbird frequented a Kentfield, MRN, feeder Dec. 14–17 (BL). Four Yellow-bellied Sapsuckers visited our region, starting Dec. 16 with a Hayward/Fremont CBC bird located at Don Castro Regional Recreation Area, ALA (DB, oob; mob). Subsequent reports came from the city of Sonoma (CHn); Bolinas, MRN (KT); and Pescadero, SM (MK, oob). Hybrid Red-naped x Red-breasted Sapsuckers made appearances Dec. 1–12 at Spring L. in Santa Rosa, SON (TRe, RE; CT; mob), and Dec. 15–16 at Fort Mason, SF (DA). An apparent pure Red-naped Sapsucker was reported Dec. 31, near the General Vallejo Home in the city of Sonoma (CHr). Eastern Phoebes continued along Guadalupe Cr. at W. Taylor St., SCL, and on Stage Rd. in Pescadero, SM (mob). Pt. Reyes and Sonoma Valley CBCs reported Eastern Phoebes from Pt. Reyes Vineyard and Winery in Pt. Reyes Station, MRN (TGa; mob), and Tolay, SON (RF, JC, oob). Los Gatos Birdwatcher Group located a 5th bird at Los Capitancillos Percolation Ponds in San Jose, SCL. A Dusky-capped Flycatcher (Myiarchus tuberculifer) was ID’d Dec. 6 at the PRNS Fishdocks, MRN, presumably the same bird that was reported Nov. 19 at the RCA towers (JL, KW; oob). Tropical Kingbirds turned up Dec. 3 in El Granada, SM (DP); Dec. 13–14 at MLK Jr. RS in Oakland, ALA (JKe; mob); and Dec. 28 at L. Merced, SF (SRu). A couple of Townsend’s Solitaires returned to Barth’s retreat, Mt. Tamalpais, MRN (EC, AD, JM), and CBCs in SON Valley and Southern MRN added Solitaires at NAP Ridge, SON (fide TRu), and Rock Springs Area, MRN (fide MF). A Lucy’s Warbler from the Walker Cr. headwaters added to the Pt. Reyes CBC species list on Dec. 15 (JC, AS). A Black-throated Blue Warbler lingered Dec. 16–30 in a persimmon tree along Pescadero Cr. Rd., SM (GHa; mob). 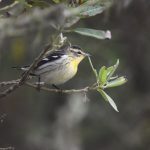 Other notable warbler sightings included a Tennessee Warbler near Half Moon Bay Airport, SM (RT, LB); a dozen Palm Warblers from various locations; 4 Black-and-white Warblers in SM and SF; and a recurring Northern Waterthrush at Charleston Marsh, SCL (MS). Four Summer Tanagers showed up this month: Dec. 17–18 behind the Bolinas Post Office, MRN (KH, JM); Dec. 20 in the bishop pine forest above Inverness, MRN (JM); Dec. 20 eating wasps at Cascade Ranch, SM (MR); and Dec. 29-31 feeding on persimmons in Woodacre, MRN (DWi; JKi). A continuing Clay-colored Sparrow at a Berkeley, ALA, feeder was voted best bird of the Oakland CBC (DG). A Field Sparrow (Spizella pusilla) visited a SF feeder on Dec. 28, just the 2nd county record (KMK). 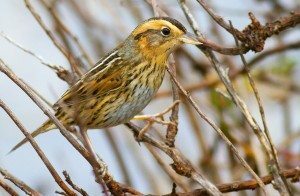 A Large-billed Savannah Sparrow was reported Dec. 10 from the breakwater at Pillar Pt. Harbor, SM (TW, PDo). An unseasonal Grasshopper Sparrow at Blufftop Park was a nice addition to the Crystal Springs CBC list (JB, KB, PM, JR). At least 9 Swamp Sparrows turned up in marshy spots around the region. Harris’s Sparrows were located Dec. 17–26 near Cordelia Junction, SOL (MH; RL, RR), and Dec. 27–31 at Oka Ponds, SCL (KO; mob). A couple female Lapland Longspurs lingered through Dec. 4 on Mt. Trashmore, Hayward RS, ALA (NA; DWe). Rose-breasted Grosbeaks visited feeders Dec. 13–17 in El Granada, SM (DP), and Dec. 21–26 in Los Gatos, SCL (LS). In addition to the resident crossbill flocks in SF and SM, Red Crossbills were noted this month at a birdbath in the Oakland Hills, ALA (SS); at Inspiration Pt., CC (MP); near Fountaingrove Parkway in Santa Rosa, SON (AW); and at the Blackberry Farm in Cupertino, SCL (RF). Evening Grosbeak reports were concentrated in the S. Bay, where, beginning Dec. 12, flocks of 5–21 birds were reported feeding in pistache trees in Sunnyvale, Los Altos, Palo Alto, Mountain View, and San Carlos. Semicolons separate original observer(s) from subsequent observer(s). Abbreviation “mob” = many observers; “oob” = other observers. CBRC review species are shown in bold. Information is compiled from BirdBox transcripts and regional listservs; the author apologizes for any errors or omissions. 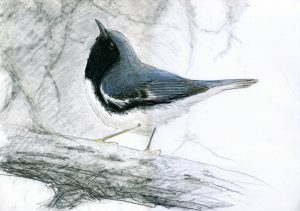 An emerging theme from this year’s fall migration was possible irruptions of northern and mountain species, particularly Pine Siskins and Red-breasted Nuthatches. Reports of Red Crossbills and Evening Grosbeaks were also noteworthy, and there was one intriguing report of a possible Bohemian Waxwing. An Oct. 7 pelagic trip to Bodega Cyn. and Cordell Bank (SON/MRN) located 3 Flesh-footed and 2 Short-tailed Shearwaters (DSi, oob). A Manx Shearwater highlighted an Oct. 1 Farallon Island pelagic trip, SF (PP, DSh, AJ, oob). Perhaps the same bird was refound Oct. 26 off Bodega Head, SON (GHu, DSh). Coastal movements of Black-vented Shearwaters were impressive, with high count of 456 on Nov. 18 from Pigeon Pt., SM (RT). The continuing Northern Gannet (Morus bassanus) remained at SE Farallon Island, SF, through Oct. 8 (AJ, oob; mob). A Brown Booby lurked off the coast Oct. 12–Nov. 11, with sightings at PRNS Lighthouse, MRN (KH; TB; oob); SE Farallon Island (MB); and Pigeon Pt., SM (RT). The PRNS sighting is just the 2nd MRN record. A Least Bittern remained at Ellis Cr. in Petaluma, SON, through Oct. 8 (CR). A trek up Mt. St. Helena on Oct. 29 was rewarded with a Northern Goshawk perched on the SON-L. county line (GHu). A soaring Harlan’s Hawk was photographed over Battery Godfrey, SF, on Oct. 17 (HC). A Lesser Black-backed Gull (Larus fuscus) visited Oyster Bay RS, ALA, on Nov. 14 (NA). On Oct. 11, a Sabine’s Gull winged past the USS Hornet in ALA (JL). Until recently considered the northern race of Xantus’s Murrelet, a Scripps’s Murrelet was spotted off Pigeon Pt., SM, on the 23rd (RT). Ancient Murrelets were reported off the SM and SON coasts on 4 occasions, with 19 birds tallied from Bodega Head, SON, on Nov. 22 (SC). Owlers located roosting Long-eared Owls at 3 locales: Coyote Hills RP, ALA, on Oct. 18 (JB); Las Gallinas Valley Sanitary District, MRN, on Nov. 15 (LS); and Oyster Pt. in S. SF, SM, on the 22nd (RT; RC, CL). A Lesser Nighthawk watched the Giants lose to the Reds at AT&T Park, SF, on Oct. 6 (DH, fide JC). A dark swift over PRNS Fish Docks on Oct. 4 was ID’d as a Chimney Swift (RS; TE). 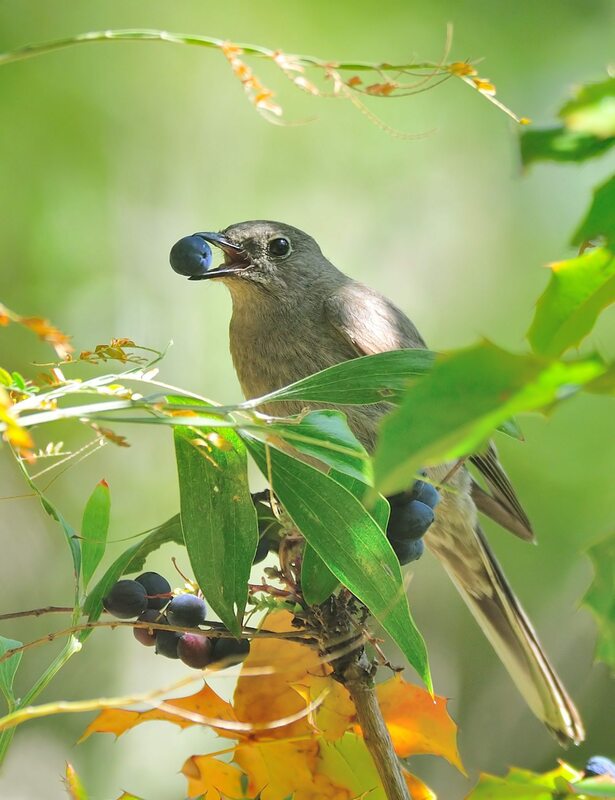 A Cordilleran Flycatcher joined a mixed flock feeding on California oak moths at Crown Beach in ALA on Oct. 10 (NA). An Eastern Phoebe returned for a 2nd winter to Stage Rd. in Pescadero, SM, beginning Nov. 18 (RT; AE, DP). A Dusky-capped Flycatcher (Myiarchus tuberculifer) turned up on Nov. 19 at the RCA Towers, PRNS, MRN (DSi; JMi). A well-marked Blue-headed Vireo (Vireo solitarius) joined a gleaner flock along Gazos Cr., SM, on Oct. 7 (GHa). A Philadelphia Vireo drew birders to N. L., GGP, SF, Oct. 9–11 (DM; mob). A Gray Catbird lingered Oct. 1–5 at Bodega Bay (RR, DF; mob). A Sage Thrasher hugged the cliffs below Battery Mendell in the MRN Headlands on Oct. 16 (DSi). Another Sage Thrasher at Bodega Marine Lab on the 23rd qualified as the 3rd SON record (JS). Careful search of the outer PRNS pipit flocks revealed a Red-throated Pipit at PRNS Fish Docks on Oct. 4–5 (RS) and at Abbott’s Lagoon Oct. 12–21 (JMi; EE). Warbler migration brought an invasion of 60+ Palm Warblers to the region, including 10–17 at Nunes (A) and Mendoza (B) Ranches at PRNS, Nov. 4–12 (JMo, DSi; mob). A Worm-eating Warbler (Helmitheros vermivorus) graced a private garden in Pescadero Oct. 18–25, qualifying as just the 3rd SM county record (MK; mob). A Painted Redstart at Mendoza (B) Ranch made birding headlines Nov. 12–15 (DSi; mob). A Field Sparrow (Spizella pusilla) eluded cats at Nunes (A) Ranch, constituting a 1st MRN record (KH; mob). A Black-throated Sparrow forsook the desert for Rodeo Lagoon, MRN, on Oct. 15 (LG, JF). Harris’s Sparrows joined Zonotrichia flocks at Stevens Cr. Mitigation area, SCL, on Oct. 30–Nov. 2 (KB; mob) and at the Grant Ave. entrance to Hayward RS, Oct. 31–Nov. 26 (BD; mob). A female Dickcissel staked out the lawn at Fort Mason, SF, Sept. 30–Oct. 13 (DA; mob). A Baltimore Oriole lingered through Oct. 5 at Diekmann’s Store in Bodega Bay (SC; mob). Semicolons separate original observer(s) from subsequent observer(s). Abbreviation “mob” = many observers; “oob” = other observers. Information is compiled from BirdBox transcripts and regional listservs; the author apologizes for any errors or omissions. Abbreviations for Counties and Others: ALA, Alameda; CC, Contra Costa; CP, County Park; Cr., Creek; Cyn., Canyon; GGP, Golden Gate Park; L., Lake; MRN, Marin; Mt., Mount; N., North; NAP, Napa; NWR, National Wildlife Refuge; OSP, Open Space Preserve; PRNS, Pt Reyes National Seashore; Pt., Point; Rd., Road; Res., Reservoir; RP, Regional Park; RS, Regional Shoreline; S., South; SB, State Beach; SCL, Santa Clara; SF, San Francisco; SM, San Mateo; SOL, Solano; SON, Sonoma; SP, State Park; SR, State Reserve. Birders eagerly await the magic of fall migration, and the season thus far has exceeded expectations. The most remarkable sighting has been a possible Common Cuckoo (Cuculus canorus) that the SCZ Bird Club discovered near Watsonville Slough on Sep. 28. If accepted, this Eurasian bird would apparently constitute just the 2nd record for the lower 48 states. A pelagic trip out of Half Moon Bay on Aug. 11 located a Yellow-billed Loon (Gavia adamsii) about 1 mile offshore in SM waters (LK, AJ, oob). Hawaiian Petrels (Pterodroma sandwichensis) were the stars of the early fall boat trips, including a 1st SM County record on Aug. 25 (MD, AJ, oob), an SF bird on Sep. 7 (AJ, oob), and a SON bird on the Sep. 21 Bodega Cyn. excursion (TMG, DS; oob). A massive near-coast movement of Sooty Shearwaters Sep. 6–15 produced a spectacle of 5,000–10,000 birds, in Half Moon Bay and Pillar Pt. Harbor, SM (mob), and an estimated 90,000 moving past Muir Beach, MRN, on the 9th (JW). The Northern Gannet (Morus bassanus) that has been oversummering on SE Farallon Island, SF, was reported regularly by PRBO researchers and provided boat-trip views on Aug. 5, Sep. 1, and Sep. 12 (DS, DW, AJ; mob). A Least Bittern was found prowling the reeds at Ellis Cr. in Petaluma, SON, on Aug. 26 (RoS). The GGRO hawk count from Hawk Hill in the MRN Headlands, MRN, tallied 27 Broad-winged Hawks on Sep. 22 and followed it up with a record-breaking 295 Broadies on the 27th (mob). An early-morning visit to King Ridge Rd., SON, on Sep. 16 yielded 7 Sooty Grouse walking across the road (BP, BEM, EG). A Black Turnstone was discovered Sep. 9 along the NAP River at Eucalyptus Rd., a 1st NAP county record (TE; JS, oob). A Curlew Sandpiper (Calidris ferruginea) was photographed on Sep. 21 at Westside RP in Bodega Bay, SON (GB, LH). The bird was not refound, but searchers were consoled with a Sharp-tailed Sandpiper that remained through the 23rd (JE; mob). A Buff-breasted Sandpiper was discovered at Abbott’s Lagoon, PRNS, Sep. 6–8 (JW; GH, JM, JCB). A White-winged Dove lingered Sep. 16–18 at Mendoza (B) Ranch and Drake’s Beach, MRN (ES; mob). A Long-eared Owl called on Sep. 24 near the Redwood RP entrance, ALA (JL). A nightjar photographed on Sep. 9 at the Winton Ave. entrance to Hayward RS, ALA, was ID’d as a Lesser Nighthawk (VB; BR, JPo). A Yellow-bellied Flycatcher (Empidonax flaviventris) was reported Sep. 1 on SE Farallon Island (PRBO), and another Yellow-bellied attracted visitors to Nunes (A) Ranch, PRNS, Sep. 6–7 (RiS; mob). A Least Flycatcher was ID’d at N.L., GGP, SF, Sep. 7–9 (RB; mob). A Yellow-throated Vireo, discovered Sep. 16–22 at Spring L. in Santa Rosa, would be a 1st SON county record (JLo; mob). A Blue-headed Vireo (Vireo solitarius) was banded on Sep. 17 near the Muddy Hollow trailhead, PRNS, MRN (EE, oob). Up to 3 Bank Swallows stopped over at Iron Horse Sanitary District ponds, CC, Sep. 8–9 (BMD, JR; AWL). PRBO researchers banded an Arctic Warbler (Phylloscopus borealis) on SE Farallon Island Sep. 28 (mob). 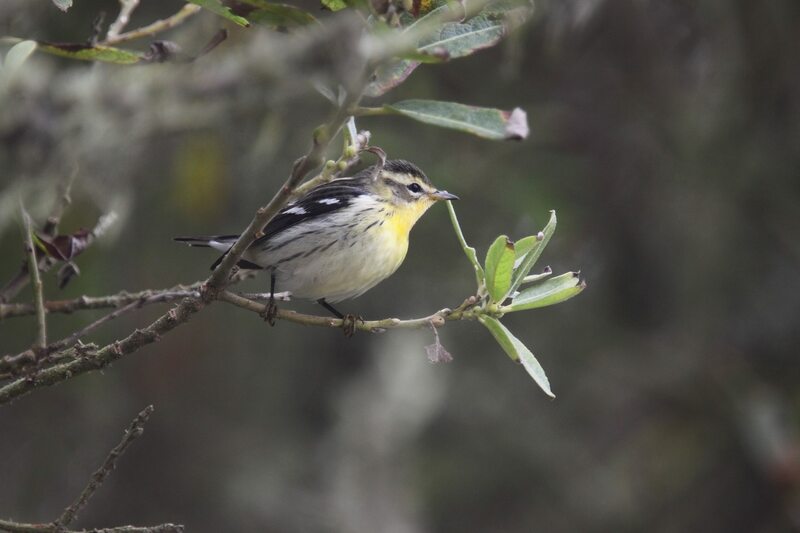 A Cape May Warbler (Setophaga tigrina) was discovered Sep. 18 near Golden Gate Toll Plaza, SF (IS, BT; mob), and a 2nd bird turned up on the 26th in Owl Cyn. at Bodega Bay, SON (DN; mob). Among numerous warbler vagrants at outer PRNS, a Connecticut Warbler (Oporornis agilis) was located at Mendoza (B) Ranch on Sep. 28 (CW, NP, MB; mob). Warbler migration brought to the region at least 13 Tennessee Warblers; 4 Northern Parulas; 14 Chestnut-sided, 5 Magnolia, 3 Black-throated Blue, 4 Blackburnian, 1 Prairie, 8 Palm, 14 Blackpoll, and 8 Black-and-white Warblers; 11 American Redstarts; 1 Ovenbird; 8 Northern Waterthrush; 1 Hooded Warbler; and 2 Yellow-breasted Chat. A Painted Bunting was found Sep. 8 on SE Farallon Island (Elizabeth Ames, oob), and a 2nd Bunting was banded on the 18th (oob). A male Baltimore Oriole entertained visitors to Vasona L. Park, SCL, Aug. 12–25 (KB, JPa; mob). The Bay Area appears poised for a Red Crossbill irruption, with flocks of 5–20 birds reported from multiple locations in ALA, MRN, NAP, SF, SM, and SON counties. The biggest pelagic news was that the Northern Gannet (Morus bassanus), first located by PRBO researchers on SE Farallon Island (SF) on Apr. 25, continued through at least Jun. 24, when it was photographed basking on the rocks (PP, TMG). A Jul. 15 boat trip failed to locate the gannet but tallied a Laysan Albatross (DA). A Jul. 4 seawatcher from Pigeon Pt., SM, observed both a Pink-footed and a Black-vented Shearwater (RT). As many as 5 Harlequin Ducks, 3 males and 2 females, lingered at PRNS Fish Docks, MRN (HBH, RS; mob). Another male remained through Jul. 15 at Pescadero Cr. mouth, SM (GH). A Long-tailed Duck was observed by kayak at Pillar Pt., SM, on Jun. 3 (BK), and another oversummered at Coyote Pt., SM, beginning Jun. 27 (RT, LB; oob). A Pacific Golden-Plover returned to its regular wintering grounds at Shollenberger Park, SON, on Jul. 4 (RR), and 2 more visited Hayward RS, ALA, Jul. 21–24 (RCi; BR). Common Terns were reported on Jul. 5 and 8 from Radio Rd. in Redwood Shores, SM (RT, DP); on the 29th from San Leandro Marina, ALA (BR); and on the 30th from the Foster City shell bar (RT). An Arctic Tern appeared for a limited engagement at the San Leandro Marina, ALA, on Jun. 26 (BR). A Black Tern was found flying over the ocean near the Great Highway, SF, on Jul. 15 (PS). A Rhinoceros Auklet made a rare foray bayside to Hayward RS, ALA, on Jul. 20 (BR), and a Marbled Murrelet followed suit on the 28th (JCh, DH). On the SM coast, 3 Tufted Puffins lingered offshore at Pigeon Pt. Jul. 4–25, and a 4th puffin flew in to join a flock of 5,000 Sooty Shearwaters at Pescadero Beach on the 18th (RT). A White-winged Dove was spotted Jul. 16 flying over Hill Rd. in Morgan Hill, SCL (SR). On Jun. 1, a Yellow-billed Cuckoo was discovered in Bolinas, MRN (PP). Black Swift movements wrapped up by Jun. 3 with stragglers flying over Monte Bellow OSP, SCL (GH); Blue Ridge Rd., SOL (CG); and Lower Crystal Springs Res., SM (DP). A Black-chinned Hummingbird turned up Jul. 9 along the Coyote Cr. trail at Silver Cr. Valley Rd., SCL (JP). A male Costa’s Hummingbird visited a Terra Linda feeder, MRN, on Jul. 3 (KJR). An Eastern Kingbird was located on a fence wire near Pescadero, SM, on Jun. 2 (RT, LB). A Red-eyed Vireo was discovered during a Jun. 4 bird census in GGP, SF (JCl). A female Purple Martin wandered over Coyote Pt., SM, on Jun. 4 (RT). Another martin was noted from Rohnert Park, SON, on the 16th (DS). A couple Bank Swallows were observed Jun. 30–Jul. 3 over Radio Rd. in Redwood Shores, SM (RT, LB). An unseasonal Townsend’s Solitaire paused Jun. 15–16 at the Coyote Hills RP Visitor Center, ALA (DD; JT). The headline news on the warbler front was a Worm-eating Warbler (Helmitheros vermivorus) that was banded on Jun. 10 at PRBO’s Palomarin Field Station in Bolinas, MRN (oob, fide RCo). Spring migrants also included a Tennessee Warbler, at least 8 Northern Parulas, a couple Chestnut-sided Warblers, a Prairie Warbler, 2 Black-and-white Warblers, an Ovenbird, and 3 Yellow-breasted Chats. A Summer Tanager was located Jun. 8 near Stanford, SCL (RCa, fide SR; mob), and perhaps the same bird was relocated Jul. 19 near Palo Alto High School, SCL (RF). This is proving to be a good year for Black-chinned Sparrows, with the Loma Prieta (SCZ/SCL) birds continuing through at least Jul. 1 (mob) and a lone singer entertaining birders Jun. 6–9 in Tilden RP, CC (BF; mob). Sage Sparrows turned up in some unusual spots, including Mt. Davidson, SF, Jun. 12–14 (DM, BF; mob); Lobos Dunes in the Presidio, SF, Jun. 16 (ME, PS); and Bedwell Bayfront Park, SM, Jun. 16 (DK). On Jul. 17, birders described a probable alternate-plumage male Lark Bunting in Sibley RP, CC (MS, JG). The regional Rose-breasted Grosbeak count topped out at 13-plus individuals. Indigo Buntings were close behind with 8 reports. A Yellow-headed Blackbird turned up Jun. 27–28 at Las Gallinas Valley Sanitary District, MRN (JW; SK). Finally, numerous locales reported Lawrence’s Goldfinches this summer, with the most unusual report from Glen Cyn. Park, SF, on Jun. 26 (DM). Herein lies a tale of spring migrants, nesting birds, and pelagic rarities! GPS coordinates for a Hawaiian Petrel (Pterodroma sandwichensis), sighted May 9 from a Holland America cruise, determined the bird to be in SF waters between Gumdrop and Pioneer Seamounts (PL). A bayside Ashy Storm-petrel was observed Apr. 21 from the mouth of Sulphur Cr. Hayward RS, ALA (BD). Rhinoceros Auklet monitors at Año Nuevo Island (SM) observed and photographed a Red-tailed Tropicbird (Phaethon rubricauda) on Apr. 29 (JB, JF). Even more remarkable, PRBO researchers on SE Farallon Island (SF) documented a Northern Gannet (Morus bassanus) on Apr. 25 and again on May 1 (PW; SW, oob). A 1st west coast record, this bird would have had to cross Central America through Panama or Nicaragua or circumnavigate Canada through the Arctic Ocean. A pair of Cattle Egrets set up housekeeping on L. Elizabeth, ALA, beginning May 10 (VR; mob). A Napa State Hospital pond near Skyline Wilderness Park, NAP, provided a rare breeding record for Hooded Merganser on May 9, when a female was found with 5 ducklings on her back (LF). A Gray Hawk (Asturina nitida), normally a specialty of SE AZ and TX Rio Grande Valley, flew past the GGRO hawkwatch site in the MRN Headlands on May 10 (TP, HB, JHa, fide AF). A Pacific Golden-Plover remained at Shell Beach in Foster City, SM, through Apr. 3 (SL). Another appeared Apr. 30 at Limantour Beach, PRNS, MRN (KMi) and a 3rd Golden-Plover lingered May 19–24 at State and Spreckles pond in New Chicago Marsh, SCL (MiM; mob). Migrating Solitary Sandpipers turned up around the region Apr. 15–May 7 from Greenville Rd. pond, Livermore, ALA (MP, ZB; JiR, SH); Bethel Island, CC (JD, DMi, MaM, LK); Hudeman Slough Wetlands, SON (AW; mob); Alpine Pond, Skyline Ridge OSP, SM (CB, KP); Battery Godfrey (flyover), SF (HC, PSa, HB); and Las Gallinas Valley Sanitary District, MRN (JE). The season’s first Semipalmated Sandpiper was reported May 31 from Frank’s Dump West at Hayward RS, ALA (BRi). A male Ruff probed the mudflats of Bodega Bay, SON, Apr. 21–May 1 (KM, fide DB; mob). Red-necked Phalarope flocks pushed through the region in early May, along with scattered Red Phalaropes, which were reported from Half Moon Bay and Pillar Pt., SM (MDF, DP); S. L. Merced, SF (DWN); and Bodega Bay, SON (DK; RR, SVV). A Franklin’s Gull spent a week at Hayward WPCP, ALA, beginning Apr. 8 (MP, ZB; BRi, RC). Perhaps the same bird made an appearance on May 12 at Coyote Hills RP, ALA (JCh), the same day that a 2nd Franklin’s Gull was found standing on the beach along the Great Highway in SF (PSa). The tail end of Black-legged Kittiwake migration was documented Apr. 1, with 11 birds moving north past Pigeon Pt., SM (RT, LB). A Common Tern was an early visitor to Elsie Rohmer Wildlife Sanctuary, ALA, Apr. 27–May 1 (JT; MRa). The south bay salt ponds attracted a couple Black Terns to Coyote Hills RP, ALA, on Apr. 29 (GT, MRa) and to the Alviso Marina, SCL, on May 8 (PD). Up to 6 Black Tern lingered May 5–9 at Iron House Sanitary District, CC (AL; JHo, TF, FDM). A bicycle big day on Apr. 15 in SCL tallied 158 species, including a Long-eared Owl in Monte Bellow OSP, SCL (RF). A Short-eared Owl was observed Apr. 11 harassing a Northern Harrier at Purissima Fields, SM (PJM). Black Swifts cruised through on their way to waterfalls to the north, beginning May 5 over County Line Rd. in Henry Coe SP, SCL (BP) and continuing through May 23 over Loma Prieta Rd., SCL (BB). Other good swift-watching spots included Twin Peaks, SF (DMo); Blue Ridge Rd., SOL/NAP (ST, LTe, JL, JS); Bedwell Bayfront Park, SM (PJM); Hayward RS, ALA (BRi); and Skyline Ridge OSP, SCL/SM (GH). A Costa’s Hummingbird added to the dual-county action on Blue Ridge Rd. on May 13 (ST, LTe). An out-of-place Calliope Hummingbird turned up in a Petaluma (SON) yard Apr. 8–9 (Dan Nelson). Calliope migration was concentrated in the chaparral habitats of ALA, CC, NAP, and SOL, primarily in April, with a late bird still frequenting Blue Ridge Rd. on May 23 (JaR). A wandering Lewis’s Woodpecker paused along Bear Valley Rd., PRNS, MRN, Apr. 19–25 (DDS; JCl, KMi). Yellow-bellied Sapsucker continued Apr. 1–7 at Sunol Regional Wilderness, ALA (VR; MP, ZB). A Dusky Flycatcher was ID’d May 23 along Mines Rd., ALA (ZB, MP). A nesting pair of Cassin’s Kingbirds returned to San Felipe Rd. east of Gilroy, SCL, by April 9 (FV, BRe; MiM, LC). Another pair was found nesting at the Recology landfill at Bloomfield Avenue, SCL (SR). Singletons were located Apr. 25 along Nimitz Way in Tilden RP, CC (BF), and the following day near SON Land Trust property in Jenner, SON (PC). A probable Bell’s Vireo in Lafayette Park, SF, was well described on Apr. 23 (RB). Up to 6 Purple Martins stopped over at N. L. Merced, SF, Apr. 12–17 (HB; mob). Flyovers were reported Apr. 16–May 7 from Lafayette, CC (JA); Coyote Pt., SM (RT); and Battery Godfrey, SF (DMo). Up to 6 Purple Martins appear to be nesting in snags below Loma Prieta Rd., SCl/SCZ (FV, BRe; BB). Canyon Wrens were located Apr. 16 along Mines Rd., ALA (DMo, MP), and Apr. 20–May 1 at Black Diamond Mines RP, CC (PSc, NS, Hugh Harvey; oob). Visitors to Black Diamond Mines RP on May 1 were also rewarded with Townsend’s Solitaire (JA, PSc, oob). A 2nd May record for the region was recorded on the 31st from Nunes (A) Ranch, PRNS, MRN (DH, HBH). Vagrant warblers began showing up in mid-May, including a Northern Parula at Mitchell Cyn., Mt. Diablo SP, CC (LK); a Magnolia Warbler along Stage Rd. in Pescadero, SM (RT, LB); 2 Black-and-white Warblers on the Alamitos Cr. trail, SCL (JP, oob); and a Hooded Warbler in Sebastopol, SON (LH). Brewer’s Sparrows visited Rush Ranch, SOL, on May 6 (RM, IP) and Bodega Bay, SON, on the 30th (SC). A couple Black-chinned Sparrows were detected May 17–30 along Blue Ridge Rd., SOL (JS; JL, JaR, RR). Three more were found singing on the 19th along Bear Mountain Rd. in Henry Coe SP, SCL (RJ, MRo), and a 4th was located on Loma Prieta Rd. on the 25th (ShP; FV, BRe). The region counted 9 Rose-breasted Grosbeaks this spring, including the return of a hybrid Rose-breasted x Black-headed Grosbeak that has frequented Gazos Cr. Rd., SM, for several seasons (GH; JMo, DS). Beginning Apr. 18, Blue Grosbeaks returned to traditional nest sites along Patterson Pass Rd., ALA, and the hills east of San Jose, SCL (RC; mob). On May 13, a Blue Grosbeak visited a feeder at Muir Beach, MRN (DMK). An Indigo Bunting contributed to a Martinez, CC, yard list Apr. 13–17 (fide HBH), and 2 more staked out a mustard field at Borges Ranch in Walnut Cr., CC, May 19–31 (EW, fide HBH; mob). 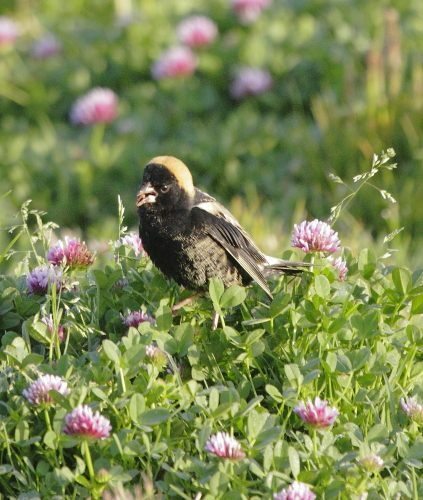 A Bobolink in full breeding plumage foraged with the blackbirds, starlings, and goldfinches at Crissy Field, SF, May 17–22 (StP; mob). A lone Evening Grosbeak was discovered May 27 in Bolinas, MRN (RDG). February was Gullapalooza month, notable for the herring runs and the thousands of gulls that swarmed in to feast on herring roe. The most notable herring run this year occurred at Fort Baker, near Sausalito. The run was a county ticker’s fantasy because birds in the water were located in SF County, while birds on land were in MRN County. Seawatches from the SM coast yielded 2 Short-tailed Shearwaters on Feb. 25 from Pigeon Pt. and a Fork-tailed Storm-Petrel on Mar. 18 from the Moss Beach Distillery (RT). Up to 5 overwintering White-faced Ibises remained through Mar. 16 at Coyote Hills RP, ALA (mob). Lingering Tufted Ducks were reported Feb. 10 at Clifton Court Forebay, CC (AL), and through Mar. 22 at L. Merritt in Oakland, ALA (mob). Observers reported the continuing presence of several Harlequin Ducks, White-winged and Black Scoters, and Long-tailed Ducks. A Rough-legged Hawk and a Prairie Falcon were both noted Feb. 12 on Skaggs Island, NAP (MB). A Crested Caracara (Caracara plancus) was photographed on Mar. 2 near the SON State University campus in Rohnert Park, SON (SB). More recent reports suggest this bird then wandered over to Yolo County. A sojourn up King Ridge Rd., SON, on Mar. 10 located a calling Sooty Grouse (L Hug, oob). Another heard-only specialty was Black Rail, 1–4 birds calling sporadically from Feb. 12 to Mar. 18 from the salt marshes at Martinez RS, CC (HBH; mob). The overwintering Ruffs at Crittenden Marsh, SCL, and Hudeman Slough, SON, continued through Feb. 22 and Mar. 22 respectively (mob). A 3rd Ruff posed at Hayward RS, ALA, on Feb. 24 (BR). On Feb. 7, the gull flock at Pilarcitos Cr. Mouth in Half Moon Bay, SM, hosted a 1st cycle Vega Herring Gull, which is a candidate for species splitting and further gull-watching torment (AJ). The star of the Fort Baker gull fest was a textbook 1st cycle Iceland Gull (Larus glaucoides) that gave observers a full week of close-up views starting Feb. 2 (SH, JM, AT; mob). 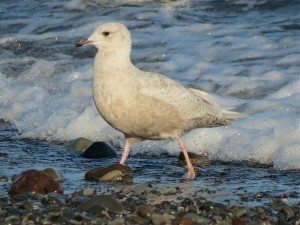 Iceland Gulls are notoriously difficult to ID with confidence, partly because they’re gulls and partly because of the extensive intergrades with Thayer’s Gulls. While CBRC has accepted only 4 records statewide, at least 5 candidates were reported around the region this period: Feb. 1 at Pacific Commons Linear Park in Fremont, ALA (NA, JCa); Feb. 5 at NAP Valley College/Kennedy Park duck pond, NAP (MB); Mar. 4 at Emeryville Marina, ALA (NA); and Mar. 18 at Oyster Bay RS, ALA (LK, NA; JLu). An adult Slaty-backed Gull (Larus schistisagus) joined the Fort Baker feeding frenzy (TE; mob). As gull watchers have honed their skills and started looking for Slaty-backs, the species has gone from unheard of to regular. This season, in addition to Fort Baker, Slaty-backs were reported at Pacific Commons Linear Park in Fremont, ALA (NA, JT; JCa); at Drake’s Beach, PRNS, MRN (RSt; TB, oob); at Salt Pond A16 at the Don Edwards NWR EEC, SCL (SR; mob); at San Gregorio SB, SM (MSc, LB, RT); at the Russian River mouth at Goat Rock SB, SON (TE; DK, BD, HK, DS); and at the original Slaty-backed hotspot, Pilarcitos Cr. mouth in Half Moon Bay, SM (AJ). Black-legged Kittiwakes increased along the coast in Feb., with sightings from Pilarcitos Cr. mouth in Half Moon Bay, SM (MSi, TG); Goat Rock SB, SON (DW, FH); Ocean Beach, SF (JCl); and Drake’s Beach, PRNS, MRN (JM, MF)—all leading up to an unprecedented 12,000-plus Black-legged Kittiwakes observed migrating north past Pigeon Pt., SM, on Mar. 2 (RT). Up to 4 Ancient Murrelets lingered in SON waters off Bodega Head through Feb. 16 (PC; CR, LM), and another pair was noted migrating north past Pigeon Pt. on Mar. 2 (RT). An owling run up Salmon Cr. Rd., SON, on Feb. 21 logged 3 Spotted Owls (DS). Short-eared Owls remained on their favored winter hunting grounds through February. The only Mar. report was of a one-eyed bird at Campbell Cove at Bodega Harbor, SON, on Mar. 14 (Randy Gibb). MRN recorded a spate of Yellow-bellied Sapsucker sightings, beginning Feb. 4 at Tomales Bay SP, MRN (BA), followed by Feb. 12 at Bolinas, MRN (CR, fide LM), and Feb. 25 at Mesa Rd., Pt. Reyes Station, MRN (JCl). ALA got in on the Yellow-bellied action with a sapsucker report Feb. 25–27 near Little Yosemite in Sunol Regional Wilderness (KH, fide BR; DW). ALA led Red-naped Sapsucker sightings with a Mines Rd. bird on Feb. 9 (RCi) and an Oakland yard bird on Mar. 2 (JLa). MRN contributed a Mar. 10 sighting from the Coast Trail at PRNS, MRN (RSc). Eastern Phoebes continued through Feb. at L. Cunningham, SCL and along Stage Rd. in Pescadero, SM (mob). New sightings were recorded Feb. 4 from Las Gallinas Valley Sanitary District, MRN (GC), and Feb. 28–Mar. 2 at Fort Scott in the Presidio, SF (HB). The Bodega Bay Tropical Kingbird shifted its home turf from Diekman’s Store to Doran RP Feb. 8–9 (oob, Madrone Audubon Society). In Richmond (CC), another Tropical Kingbird teased birders from behind a chainlink fence near the 51st St. entry to the Bay Trail, Feb. 11–Mar. 4 (RCo, fide BL; mob). A Plumbeous Vireo along Coyote Cr. in San Jose, SCL, Mar. 29–31, represented a triumph of both location and ID skills (BB; DW). A pair of Mountain Bluebirds made a rare foray to sea level near CCFS, SCL, Feb. 1–20 (MRo, PD; mob). Townsend’s Solitaires were located in selected high-elevation locations, including Feb. 5 near Barth’s retreat on the slopes of Mt. Tamalpais, MRN (LK), and Mar. 10 along King Ridge Rd., SON (L Hug, JM, oob). A Yellow-throated Warbler (Dendroica dominica) was discovered Feb. 27–Mar. 11 at Coyote Pt. Recreation Area, SM (RT; mob). Either the bird relocated from Ferry Park, SF, or the Bay Area enjoyed 2 Yellow-throated visitors this winter. A Lucy’s Warbler on Yerba Buena Island, SF, Feb. 2–5, was quite possibly a Ferry Park transplant (AM; MRa). Other Parulidae highlights included a Tennessee, 5 Palm, and 2 Black-and-white Warblers; an American Redstart; and 2 Northern Waterthrushes. 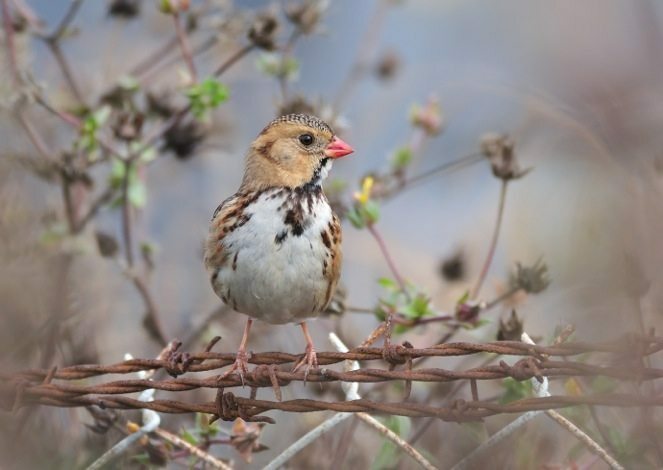 The brussels sprout dump at Cascade Ranch, SM, remained a sparrow magnet through mid-March, rewarding visitors with glimpses of the continuing Harris’s and Swamp Sparrows, numerous more common birds, and a pungent olfactory experience (mob). A 2nd Harris’s Sparrow lingered through Mar. 6 in a Campbell backyard, SCL (L). 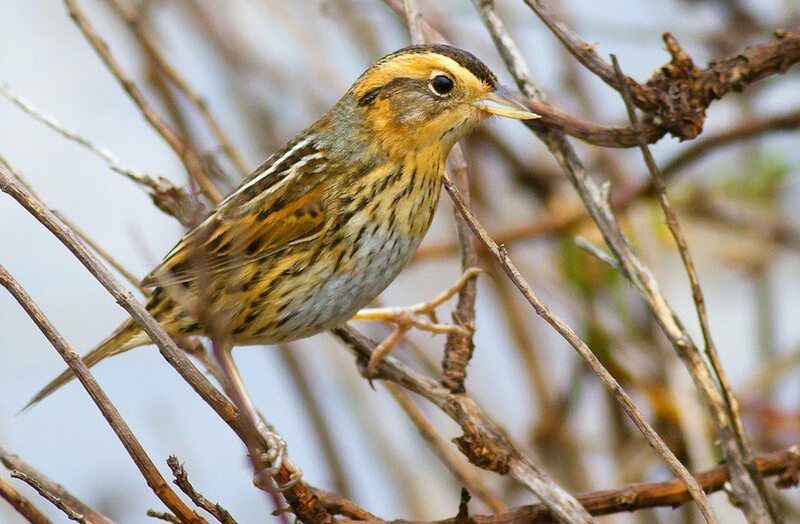 Birders who visited Skaggs Island, NAP, in search of Short-eared Owls were rewarded with bonus sightings of Swamp Sparrow and a flyover Lapland Longspur on Feb. 12 (MB). Photo by Davor Desancic / www.flickr.com/photos/ddsimages. Unusually warm dry weather made for remarkably pleasant birding for the region’s many CBCs but boded ill for the state’s skiing and agricultural industries. CBC species counts tended to be above average, but individual count numbers appeared down. Duck counts on SF Bay were alarmingly low, though documented irruptions in places like Belize suggest that they may have simply gone elsewhere this winter. The Dec. 17 Pt. Reyes CBC highlight reel included a Yellow-billed Loon (Gavia adamsii) fishing at the mouth of Walker Cr. atTomalesBay, MRN (JC). Unusual east winds brought an invasion of Tundra Swans to the region Dec. 1–2, including 100+ in western MRN (JMi, KH); 70 in the salt ponds at Coyote Hills RP, ALA (SD; DD); 22 on L. Hennessey, NAP (MuB); 5 swimming offshore at Venice Beach, Half Moon Bay, SM (Malia DeFelice); and 4 more at Pt. Isabel, Richmond, CC (JeH). Harlequin Ducks overwintered at their historically favored spots, including Mussel Rock Park, SM (JR, oob; mob); N. Beach and Tomales Pt., PRNS, MRN (DDS, IS, JC, AK); and Mile Rock, SF (JC). Black Scoters explored SF Bay at Coyote Pt., SM, Dec. 9 (RT); Berkeley Pier, ALA, Dec. 27 (BD, JaH); and Richmond Marina, CC, Jan. 8–29 (JoH; mob). Likewise, bayside observers were treated to Long-tailed Ducks on Dec. 6–8 from Foster City, SM (ST; JS); Dec. 9–Jan. 25 at Coyote Pt., SM (RT); Dec. 28 on Salt Pond A2W, SCL (PK, RK); and 3 females Jan. 8–11 at the Richmond Marina, CC (JoH; mob). An overwintering juvenile Swainson’s Hawk was located Dec. 17 inChilenoValley, MRN (TB, DaW). Rough-legged Hawks were reported Dec. 10 and 12 from habitats that bear a passing resemblance to tundra, at Hudeman Slough, SON (PC, GeH) and Midway Rd. and Lindemenn Rd., ALA (SH). A Pacific Golden-Plover lingered Dec. 8–18 nearMillbrae Avenuein Burlingame, SM (DP; mob). Speculation arose whether it was the same bird that persisted Dec. 17–Jan. 22 at the Foster City Shell Bar, SM (LF, oob; mob). Two Stilt Sandpipers turned up on Dec. 18 at Salt Pond A12, SCL, where they remained through Jan. 15 (MRo, SR; oob). Overwintering Ruffs drew visitors to Hudeman Slough, SON, Dec. 8–19 (MuB; mob) and to Crittenden Marsh and Salt Pond A2W, SCL, Dec. 19–Jan. 22 (MM; mob). A Lesser Black-backed Gull (Larus fuscus) was discovered Jan. 23 at San Leandro Marina, ALA (NA). Observers did not determine whether it was the same bird that was reported from Pacific Commons Linear Park in Fremont, ALA, on Nov. 28. Back at Pacific Commons, an adult Slaty-backed Gull (Larus schistisagus) on Jan. 29 could well have been the same bird reported from that gull hotspot Nov. 17–25. Elsewhere, a possible 3rd winter Slaty-backed Gull was documented at theRussianRiver mouth, SON (GeH), and a 2nd cycle bird joined the gull flock at Francis Beach,HalfMoonBay, SM (AJ). Black-legged Kittiwakes were discovered Dec. 17 at McClure’s Beach, PRNS, MRN (PP), and at Pillar Pt., SM (RT, LB). A 3rd Kittiwake turned up Jan. 30 at Francis Beach, Half Moon Bay, SM (LF). A scrupulous seawatch from Bodega Head, SON, revealed a Long-billed Murrelet (Brachyramphus perdix) on Dec. 4 (RS; oob). Ancient Murrelets were relatively common this winter, with high counts of 20+ from Bodega Head, SON (RS; mob); 13 from Pillar Pt., SM (RT, LB); 12 from Tomales Pt., MRN (IS, JC, AK); and 10 from Pigeon Pt., SM (RT, LB). A couple birders who couldn’t wait for organized pelagic trips took a fishing trip out of Bodega Harbor and were rewarded with a probable fly-away Parakeet Auklet (Aethia psittacula) off the SON coast on Jan. 28 (GeH, PC). On Dec. 19, a Long-eared Owl was photographed on a bike after it stunned itself flying into a window at the Baker Beach Apartments in the Presidio, SF (DF, fide JC). It apparently flew off unharmed. On the 30th, a pre-dawn calling Long-eared Owl made the yard list in Kenwood,SONValley(RR). County birders were able to tick Yellow-bellied Sapsuckers inALA, MRN, SM, and SCL counties. Red-naped Sapsuckers were ID’d inChilenoValleyand Bolinas Lagoon, MRN (DaW, JC); Pescadero, SM (DaH); and near Charleston Marsh, SCL (BB). 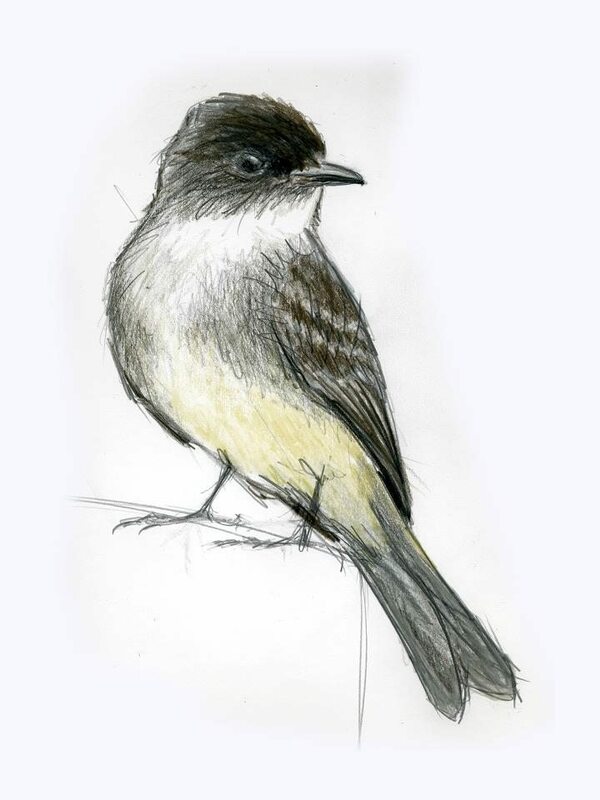 A Least Flycatcher was first detected Jan. 24 at Ragle Ranch RP in Sebastopol, SON, where it stuck to the budding willow trees through the end of the month (LH, DN; DS). An Oakland CBC Empidonax at the Dunsmuir-Hellman Historic Estate (ALA) turned out to be aHammond’s Flycatcher (PB; ES). AnotherHammond’s turned up at Jordan Pond in Garin RP inHayward,ALA, on Jan. 30 (JT; mob). An overwintering Pacific-slope Flycatcher was found along Lagunitas Cr. near Pt. Reyes Station, MRN, on Dec. 17 (JWi, oob). Eastern Phoebes were well represented, with 5 total in the region. The Pescadero, SM, bird remained on Stage Rd. through Jan. 16 (mob). Two different birds were located mid-Dec. at outer PRNS: Dec. 7–9 at Nunes (A) Ranch (MBr, OJ, MO; KP) and Dec. 8–19 at the Muddy Hollow Trailhead (CR, DL, XC, FM; LMu). In SON, an Eastern Phoebe turned up on the Jan. 18 Tolay Cr. Ranch survey (PC) and SCL recorded the 5th Phoebe Jan. 20–24 at L. Cunningham (PD; oob). The Fremont, ALA, Vermilion Flycatcher remained at L. Elizabeth through Dec. 9 (mob). A 2nd Vermilion Flycatcher turned up in ALAon Dec. 7 on private property near Las Positas Golf Course in Livermore (WL, MRi). The highlight of the SF CBC on Dec. 27 was a Dusky-capped Flycatcher (Myiarchus tuberculifer) located near Mallard L., GGP, where it lingered through Jan. (AH; mob). A Tropical Kingbird visited Diekman’s Store inBodegaBay, SON, on Dec. 4 (RS; oob). A 2nd bird dropped by the concrete bridge at S. L. Merced, SF, on the 11th (HC). AtFairwayPark inPacifica, SM, photo documentation showed a 3rd Tropical Kingbird endorsing the no-golfing campaign Dec. 27–Jan. 5 (JMo, BH; mob). An overwintering Cassin’s Vireo spent New Year’s Eve atStinsonBeach, MRN (RS). A Mountain Chickadee wandered downhill to theWinton Avenueentrance to Hayward RS,ALA, Dec. 6–7 (SM, JL; BR). Mountain Bluebirds were reported from their usual east-county haunts Dec. 3–Jan. 29 along Byron Hot Springs Rd., CC (DeW, SL; oob), and Dec. 17 along Patterson Pass Rd., ALA (KW). Following a successful Townsend’s Solitaire search at the summit ofMt. St.Helenaon Nov. 8, several birders made the hike in January and were rewarded with sightings in both NAP and SON counties (DS; GeH, RR, FH). Solitaires were also discovered Dec. 26 at Bohemia Preserve, SON (GB), and Jan. 7–12 atopSan BrunoMountain, SM (LG, KB). On Dec. 28, a Bohemian Waxwing was discovered feeding on Toyon berries with a Cedar Waxwing flock at L. Hennessey, NAP, but it could not subsequently be relocated (RR). The SF Yellow-throated Warbler (Dendroica dominica) remained in residence in the poplars atFerryPark & SueBiermanPark, SF, through Jan. 1 (JH; mob), where it was joined by 2 Lucy’s Warblers, and a host of more common warblers. Winter warbler counts included 2 Tennessee, 3 Nashville, a Cape May, a Blackburnian, a Prairie, 5 Palm, 7 Black-and-white, a MacGillivray’s, and 2 Wilson’s Warblers, along with an American Redstart and 3 Northern Waterthrush. Wintering Summer Tanagers were reported from Bolinas Lagoon, MRN (KH); Pescadero, SM (MK; DaH);Berkeley Aquatic Park,ALA (JK; mob); andTunnel Rd. inS. Berkeley,ALA (GC, KL; MRa). On Jan. 2, a Green-tailed Towhee called repeatedly from the summit of N. Peak Mt. St. Helena, SON (DS). A possible Vesper Sparrow was reported on multiple occasions Dec. 23–Jan. 14 from the rotting brussels sprout mounds at Cascade Ranch, SM (KJ; GD). Birders were initially drawn to the spot by a lingering Harris’s Sparrow beginning Dec. 11 (RT, LB, MS; mob). Another Harris’s Sparrow visited aCampbell, SCL, feeder Dec. 4–7 (LMy; TG, BB). A Grasshopper Sparrow was a rare winter visitor to Candlestick SRA, SF, starting Jan. 23 (DM; mob). High tides flushed a couple Nelson’s Sparrows from Arrowhead Marsh, MLK Jr. RS,ALA, Dec. 25–Jan. 25 (MBe, MRa; mob). Longspur watching was good at the Spaletta Plateau, PRNS, MRN, in early Dec., where flocks numbered up to 35Laplandand at least 1 Chestnut-collared Longspur (JMi; GT, KF). A Rose-breasted Grosbeak visited anAntioch, CC, feeder Jan. 29 (PS, NS). A Blue Grosbeak joined the Eastern Phoebe on Stage Rd. in Pescadero, SM, starting Dec. 31 (DK; mob). Male and female Yellow-headed Blackbirds remained through Jan. 26 with the Blackbird flocks atPacificCommonsLinearPark(SH; mob). Orchard Orioles returned to SF Dec. 15–Jan. 29 atFortMasonCommunityGarden(RB; mob) and Jan. 16–20 at the Botanic Gardens in GGP (DA; DM).